Concrete Beach Brewery is hosting their 4th Annual Blocktoberfest, which has grown into a street-closing festival this year! 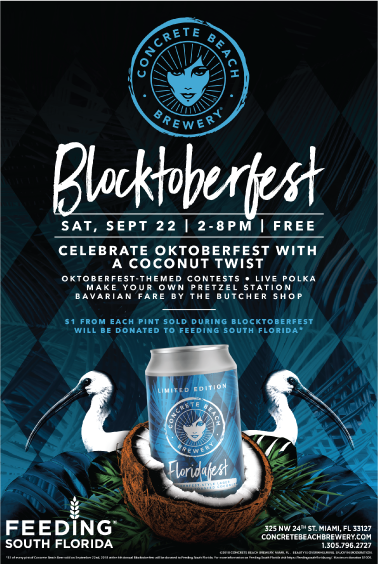 Concrete Beach Brewery will be celebrate Oktoberfest with a Coconut Twist, live polka, make your own pretzel station Bavarian fare by the Butcher Shop. From each FloridaFest beer sold during Blocktoberfest Concrete Beach will donate $1 to Feeding South Florida, that’s enough to provide 6 meals for our neighbors in need of food assistance. It’s time to eat, drink, dance and be merry while ending hunger in South Florida! Throughout the year, Feeding South Florida hosts or is the recipient of proceeds from events hosted by community partners who support our mission to to end hunger in South Florida by providing immediate access to nutritious food, leading hunger and poverty advocacy efforts, and transforming lives through innovative programming and education. Participation in these events, whether it be via business sponsorship or the purchase of individual tickets, not only provides funds to help end hunger, but also shows support and creates awareness for this ever important issue. It’s just another way community members can help their neighbors in need.View our calendar of events, or, even better, register to receive our electronic newsletter at the footer of this website and never miss the latest information on our upcoming community events.